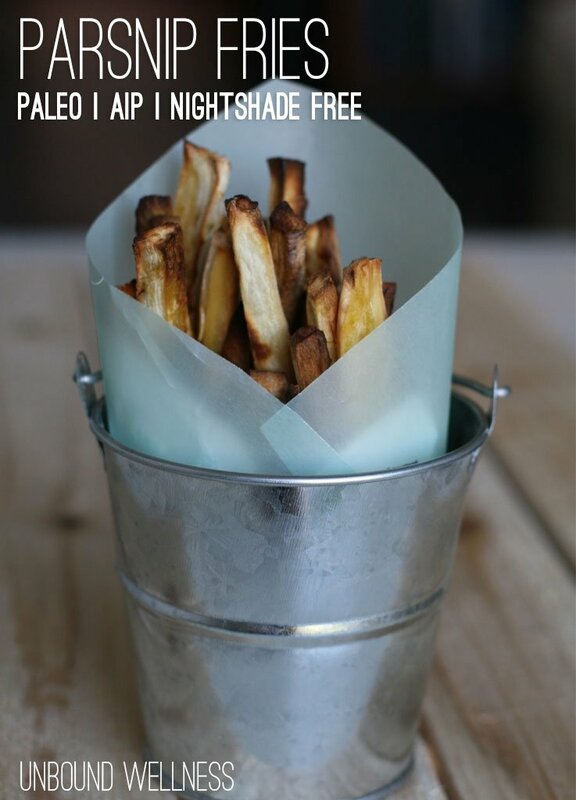 One of my favorite pre autoimmune protocol and nightshade free lifestyle favorites was french fries. Luckily, they’re also one of the easiest things to replace and find substitution for. Sweet potato fries are the norm, and commonly referred to as the healthier version of french fries, but anyone following AIP can tell you that they get a little old after a while. That’s why I’ve turned to parsnip fries! I remember how I used to feel pulling out of a drive through and having my car instantly fill with the strong scent of french fries. My right hand would always find the bag instantly, eyes still on the road, grabbing handfuls of greasy, hot fries at a time. I’d be lucky if I still had enough to event make it worth emptying the carton by the time I got home. Now, I literally feel nauseous when I get a whiff of white potatoes. Not to say that the occasional french fry is bad per se. People often bash the paleo movement because they call it restrictive and dogmatic. I don’t believe in being either, but if you literally get physically ill and it harms your health to eat white potatoes, ditch the white potato fries and bring on the parsnip fries. Parsnips are closely related to carrots, and basically look like big white carrots. What’s nice about parsnips as opposed to sweet potato fries is that they’re much easier to slice into fries. They’re a lot less dense and more symmetrical for peeling as well. Not to mention they’re full of folate and vitamin C, making them not only a delicious alternative to white potatoes, but one that’s more nutrient dense. Save the peels and tops for broth! These fries have amazing flavor, and texture! I just love the rich taste that avocado oil ads to it. I typically serve mine with a lighter flavored protein like chicken or salmon, and pair it with some greens, and avocado… because, avocado. Parsnips have great flavor on their own which is why I love to save the tops, tips and any cuts of fries that turn out to be delinquent thanks to my not so great knife skills, and save them for bone broth. I’m actually going to be sending out my gut-healing bone broth recipe, along tips on making it cheap, and getting the best quality bones to make your own gut-healing bone broth! Sign up for my newsletter to get it the recipe on Tuesday along with other exclusive content that I only share with my email friends. 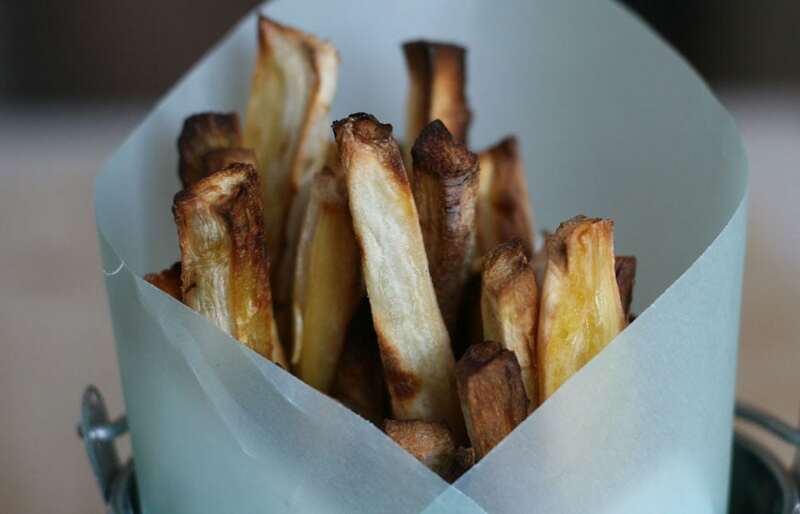 What are your favorite alternatives to potato french fries? Sweet potato? Parsnip? I make carrot fries a ton, but I’ve never worked with parsnip before! I need to search for some nearby! If you like carrot fries, you’ll love parsnip fries! 🙂 The textures is just so awesome, and they’re so delicious. Hope you like them! Hi Michelle. These fries look awesome. Thanks for linking up to the Paleo AIP Recipe Roundtable. I hope you’ll join us again! Thanks so much Raia 😀 I really appreciate it! Yum, what a great idea. The directions say to cut the fries into 2″ diameter? That doesn’t sound right.. was it supposed to be 1/2″? I want to try these as soon as I get to the store for the parsnips. Made this for a family gathering and they were a hit with the 6 year old as well as the 67 year old!